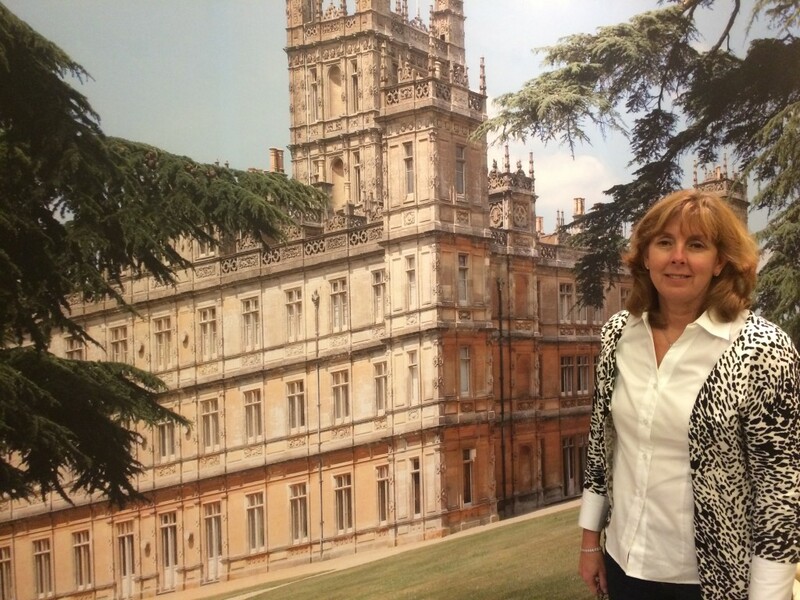 Let’s see where did I leave you last….oh yes, the Hubster and I were just about to use our time stamped tickets to visit the costumes of Downton Abbey. 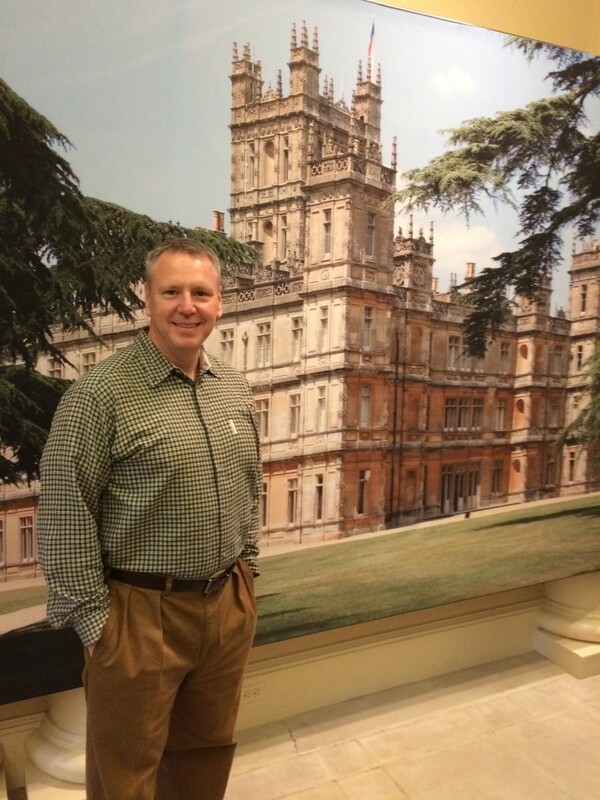 Just before we ascended the stairs to visit the exhibit Lord Hubster posed for a photo in front of his country estate. As you can clearly see the Hubster was being a very good sport about being dragged accompanying me to visit the Costumes of Downton Abbey. I would like to go on the record as stating that as payback I did watch the Walking Dead season premier with him; although I spent most of the hour covering my eyes. I think we are officially even. 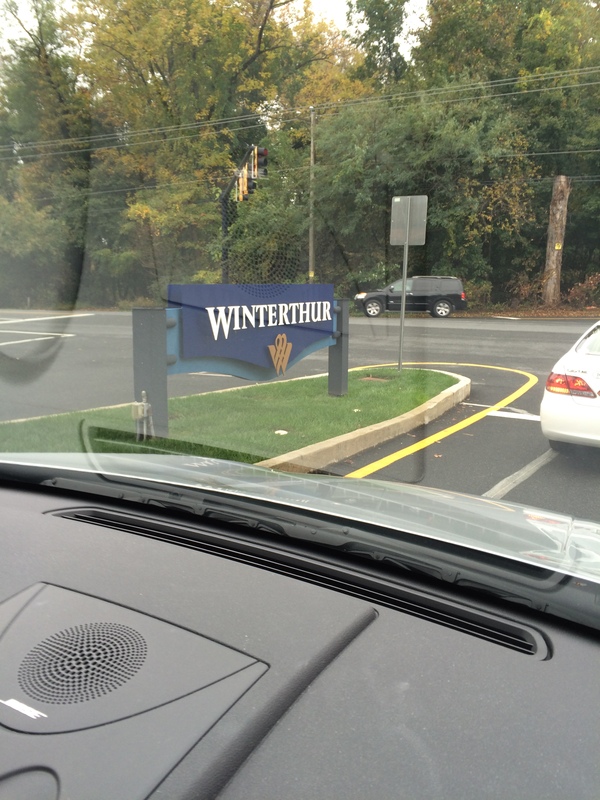 Every estate needs a Lady…. There were many people waiting to capture my a photo so I was lucky to have this one alone. 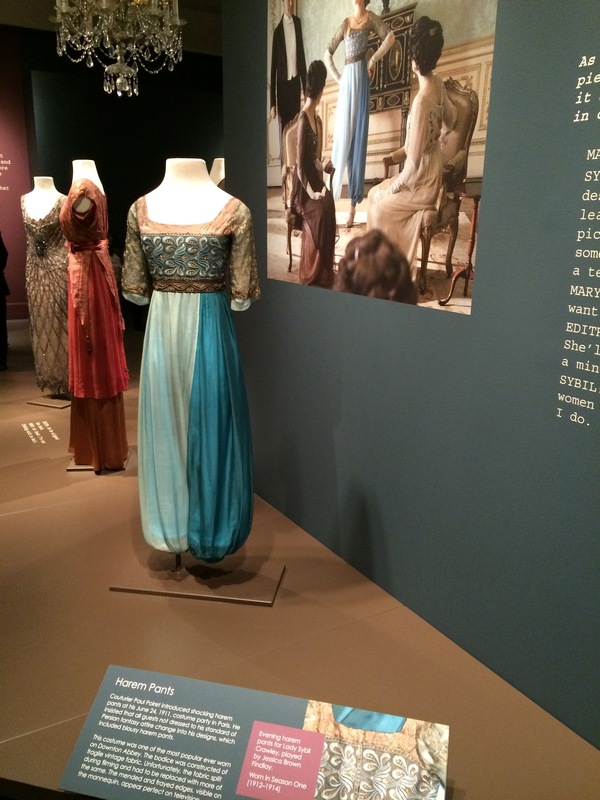 An interesting feature of the exhibit was the comparison of life at Winterthur, the former home of the du Ponts, where the costumes are exhibited, and life at Downton Abbey. 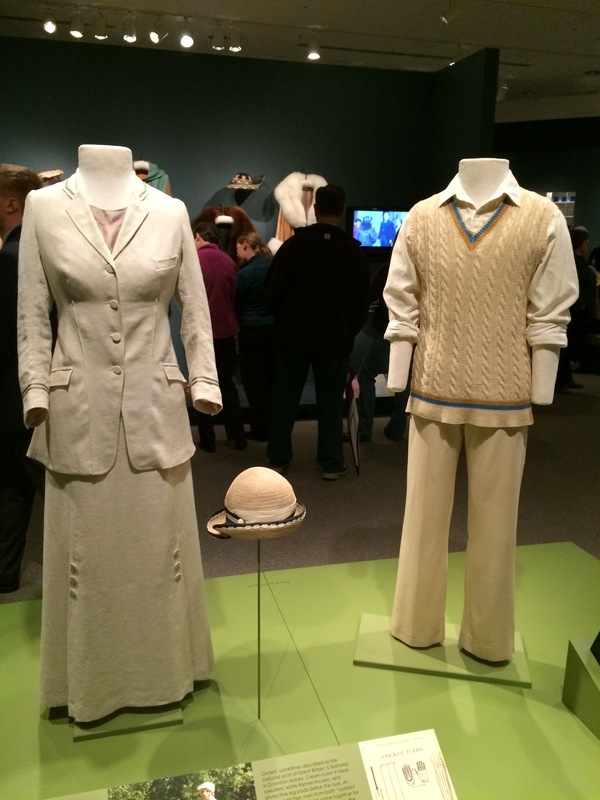 Dresses and downstairs uniforms from the first season. It’s a good thing there were some photos of the cast…Hubster was feeling quite lonely in the testosterone department. 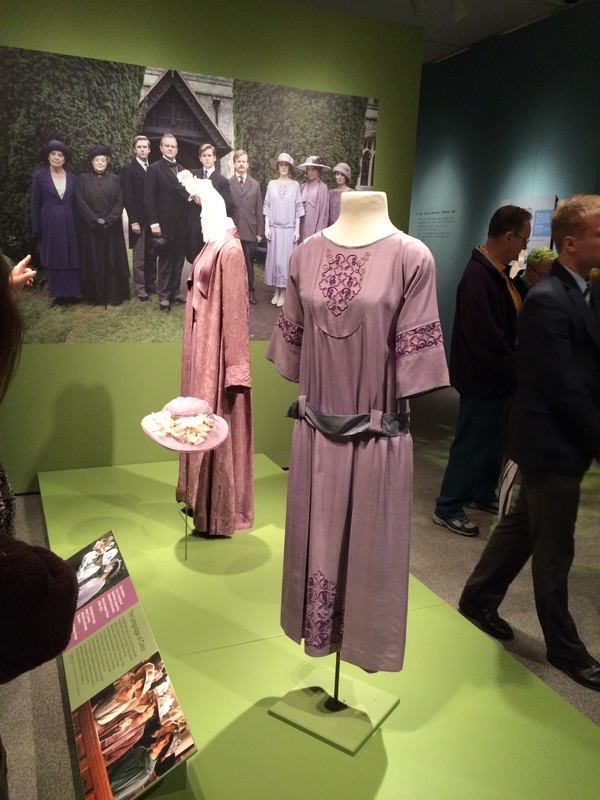 The costumes are lovely from the Christening of poor Sybil’s baby….and look to the left, men shuffling through the exhibit. 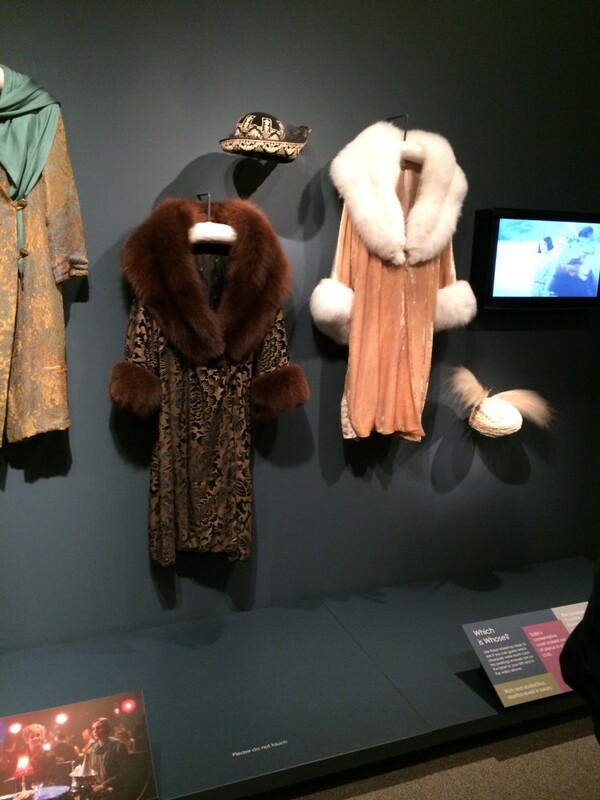 The darker brown was worn by Shirley MacLaine’s character. Some scenes from the episode where the coats were worn are shown to the side. It’s amazing how different the clothing looks on TV. Articles of clothing worn during sporting events…pre-yoga and sweatpants era. I’d like to claim another man was present in the background, but I think it is the same man from the other photo. 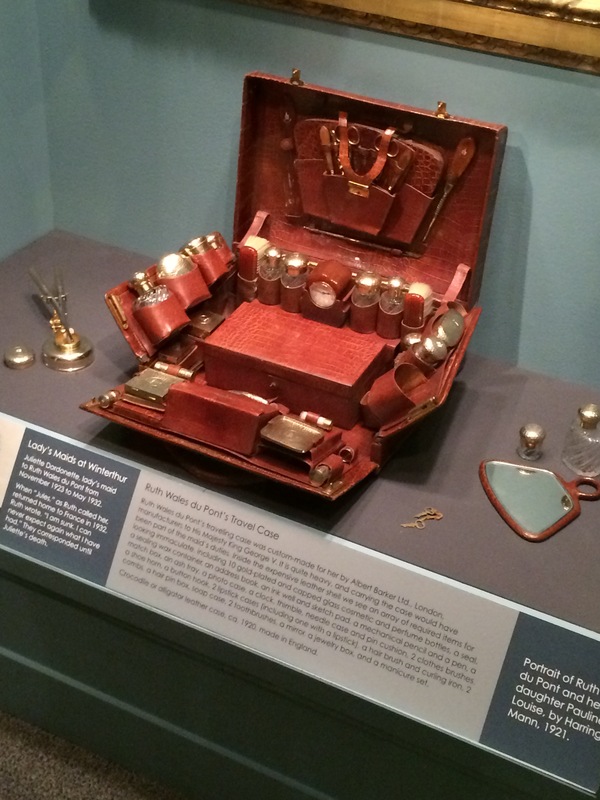 This toiletry case belongs to a du Pont of years ago…I believe the size of it alone would exceed carry-on limits today. 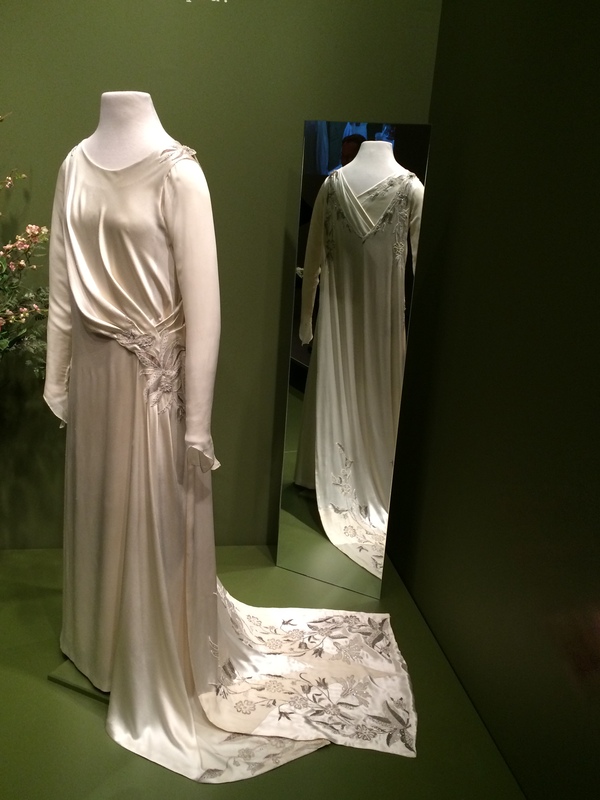 This was Lady Edith’s “almost” wedding dress…I never appreciated the beautiful embroidery in the train. So much nicer than “the every bride” for the last three weddings I’ve attended strapless dress. 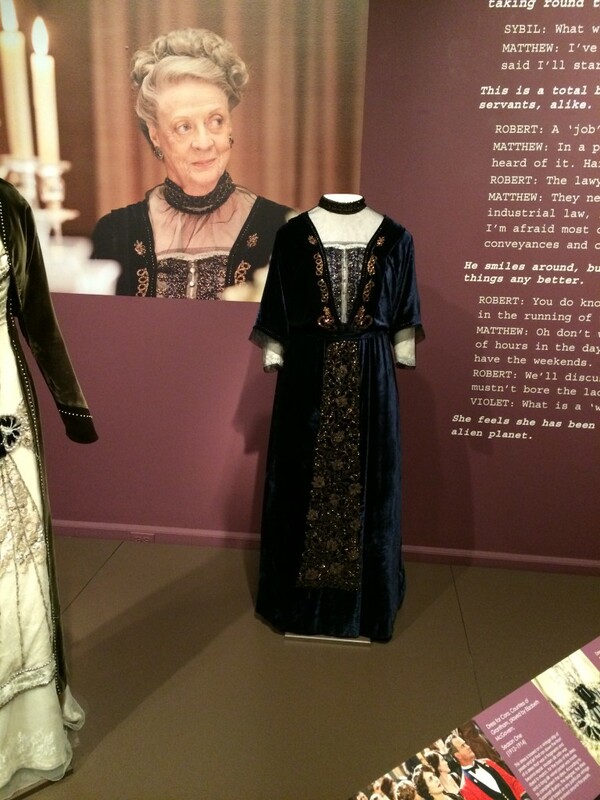 I loved the look on everyone’s face when Sybil appeared in this ensemble. 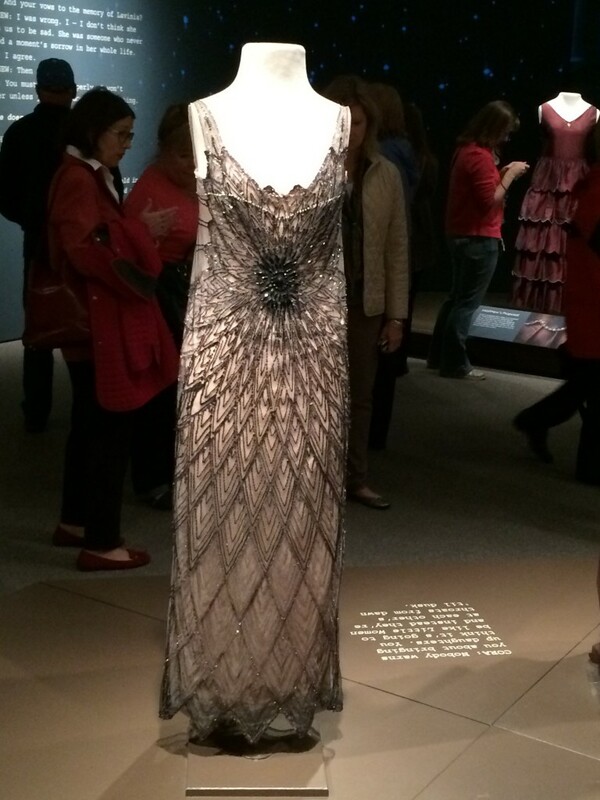 A dress worn by Lady Mary …I think I could wear it on one leg..if I could get it past my thigh. This was a real stunner…my photo does not do it justice. There is another man lurking in the shadows…so far I count four including the Hubster. You can’t help but love her character for her wit and brutal honesty…. She carries off the sheer neckline long before Vera Wang..wait a minute these characters are not real people…I keep forgetting. 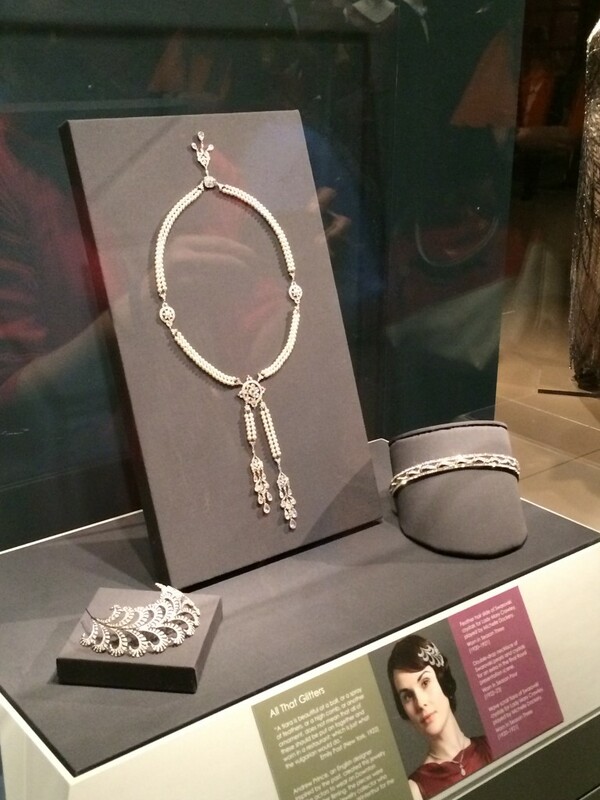 All that glitters is not a crown…but pretty close. 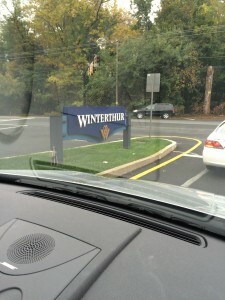 Hubster told me to take this photo quickly as we were driving away…he had to get home in time to prepare for the zombie apocalypse on Sunday night…one can’t be too careful and let the weekend disappear. Happy Thursday…the weekend is only a day away. 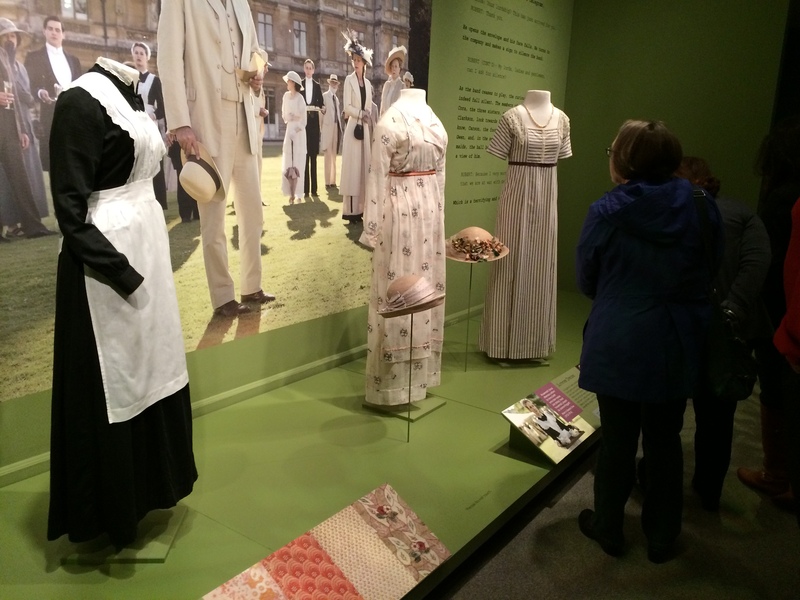 This entry was posted in Garden, Screening Now, Travel and tagged costumes, Downton Abbey, museum, Wilmington Delaware, Winterthur. ← What is a “Weekend”? 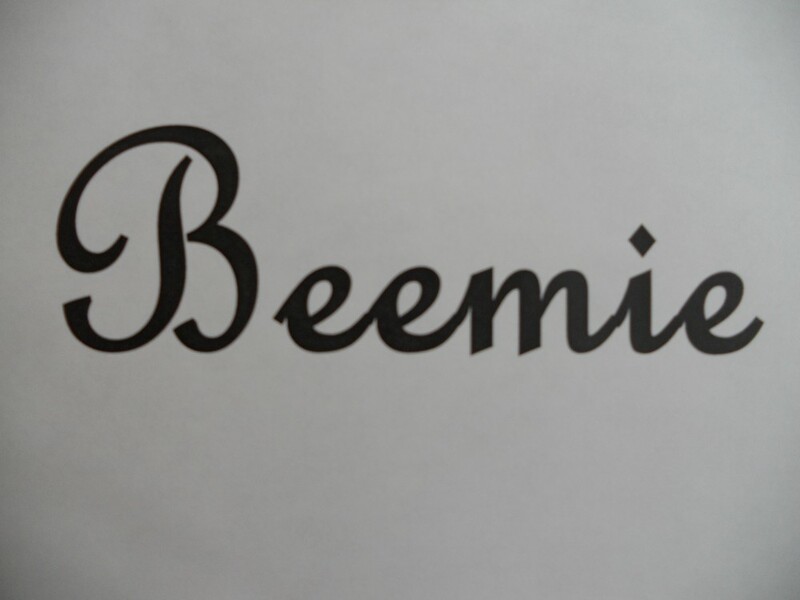 Oh Beemie… great pics! I would do anything to see that exhibit. How fun. I wonder if it will come to Boston. Your hubby is adorbs!